Toronto – September 15, 2015 – UFCW Canada has called on the Harper government to stop playing fear-mongering politics and speed up the process to bring Syrian refugees to Canada, and has contributed with other labour allies to establish a Canadian Labour Congress/Canadian Council for Refugees fund to help support the settlement of Syrian refugees in Canada. The fund will be administered by the Canadian Council for Refugees and funds will be distributed to its member agencies with expertise in settling refugees. Over the past decade, UFCW Canada has worked with the CCR on a number of refugee initiatives. "In the face of this terrible humanitarian crisis, the Harper government has coldly and callously disregarded its pledge to provide at least 10,000 Syrian refugees with a safe haven in Canada, while in reality only allowing in about a thousand," says UFCW Canada National President Paul Meinema. "Every delay by the Harper government has directly endangered the lives of Syrian refugees who have appealed to come to Canada." "While Canadians, the labour movement, and communities coast to coast have shown they are ready to help, that good will has been thwarted by a government that has been stridently anti-refugee throughout its decade in office," says Brother Meinema, "and decidedly negligent in providing adequate government resources to speed up the screening, visa, and sponsorship process for Syrian refugees." In the face of the one of the worst refugee crisis in decades, UFCW Canada has also joined with the CLC, allies and the CRC to call on the Harper government to cut the red tape, streamline the private sponsorship process, and to directly government-sponsor and assist 10,000 Syrian refugees to come to Canada immediately. "Over the generations, refugees have made a tremendous contribution to Canada," says the UFCW Canada leader. "The Harper government must honour its commitment, without excuses or delay, and respect the legacy and responsibility of Canada as caring and compassionate community." 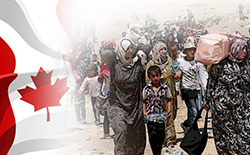 Send a message to Prime Minister Harper and tell him take real action on the Syrian crisis. To find out more, you can also visit the Canadian Council for Refugees.